This month's list is a wee bit late, but things have been rather busy around these parts (when are they not, really?) and I haven't been able to make time to post anything. 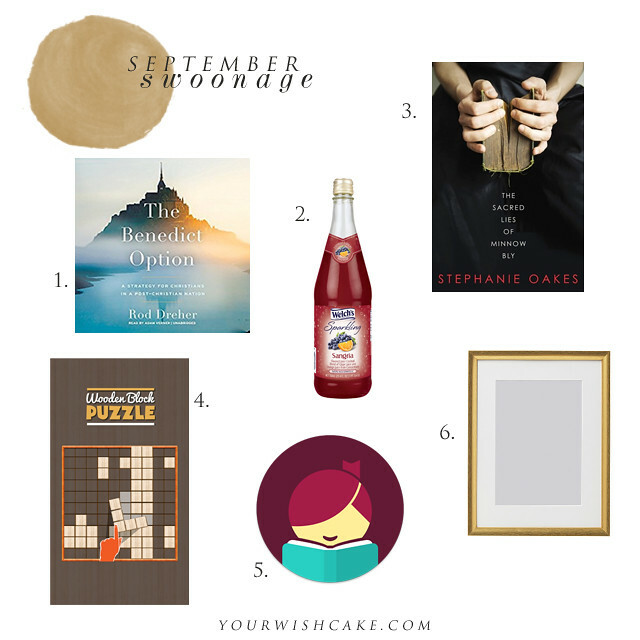 Without further ado, here are some favorites from the month of September! 1. The Benedict Option by Rod Dreher — First things first: This book will in no way appeal to you if you don't consider yourself to be a conservative of the Christian faith. I don't like to get political here (there's enough of that on the internet and debating things makes me sweaty) but this book is such a gem that I had to share it with those of you who may also appreciate the author's insight. We were going through this book recently at our church, and I was able to listen to the audio version for free on Hoopla. The narration is done very well, and I think it was easier to get through the book on audio as opposed to reading a hard copy (mostly because the beginning of the book is heavy on history and other information that is a little hard to digest at times). In any case, this is a fantastic read and it gave me so much to think about as a Christian, as a parent, and as an American. 2. Welch's Sparkling Sangria — So, truth be told, I've been missing drinking something other than water and my morning cup of coffee during this pregnancy. I saw this during a recent trip to ALDI and ended up buying it on a whim (it was less than $3, so even if it wasn't good, at least I wasn't spending a lot). It ended up being so good. Maybe it's just my weird, pregnancy tastebuds talking, but I have a feeling I shall be buying this many more times during the upcoming holiday season. 3. The Sacred Lies of Minnow Bly by Stephanie Oaks — This is one of the best books I've read this year. I typically steer clear of YA fiction, but a friend so highly recommended this one that I had to give it a try. It reads much more like an adult novel than most YA I've read, and it's one of those books that is almost impossible to put down after reading the first few pages. It follows the story of a teenaged girl who is charged with a violent crime after escaping a cult that had her isolated in the woods for more than a dozen years. (Have we established that I will pretty much anything that has to do with cults? It's an issue.) There is some graphic violence and a few scenes that were hard to get through, but making it through the gritty parts is worth it. It's such a unique story and incredibly well written. 4. Wooden Block Puzzle app — I haven't had a game installed on my iPhone since Eisley was a newborn and I was on a Candy Crush kick along with the rest of humanity. Mostly, I don't like having anything on my phone that becomes something I use to pass time when there are better things to occupy my mind (I already have enough trouble getting sucked into endless IG scrolling). But when this app was recently recommended on the Sorta Awesome Podcast, I was rather curious and had to check it out. Aaaaaaand now I am obsessed. I typically end up playing it a bit in the evenings when I'm laying on the couch eating an ice cream sandwich in all my exhausted, pregnant glory. It's a very satisfying game, and if you ever found yourself addicted to Tetris in your youth, I promise you will enjoy this app way more than is probably healthy. 5. Libby app — Two apps in one post? I know! It's a strange world we live in. But this app—which is by the folks that brought you Overdrive—is such an upgrade from the original Overdrive, which lets you borrow audiobooks and ebooks for free when linked to your library card. I was having trouble linking my new library card to Overdrive last month and was sent to this app instead. The design is so beautiful and easy to use! If you aren't using this one (or Hoopla) to listen to audiobooks for free, you're missing out. Between both of those apps, it's rare for me to not be able to find what I'm looking for. 6. Ikea SILVERHOJDEN Frames — I've been wanting to frame some larger prints for ages, but so many frames end up being cost prohibitive—even when shopping at good ol' Target. I ended up finding these frames in a 16x20" size for only $9.99 each at Ikea. I bought three to fill a blank wall in our place that has been hurting my eyeballs since we moved in early this year. Even though some may say gold is trendy, I love these frames, and using black and white photos inside keeps the look simple. I'm actually planning on buying a few more of these for the wall beside our staircase, because a staircase photo gallery has always been my dream and now it shall finally come true. Thanks, Ikea! Let me know if there are any swoon-worthy items you've discovered within the last month! I always love to hear about them. I loved those Welch's sparkling drinks during my pregnancy, but they always gave me heartburn. Total backfire. I never tried the Sangria one though! I checked out The Benedict Option awhile ago (because I'm totally on a Catholic reading binge) but I'm so not a political person that I couldn't get into it and returned it! I keep hearing good things about it, though, so maybe I should try it on audio. I have such a hard time with the Overdrive app that I hadn't bothered to download Libby - but with this endorsement, I will! Oh my, these audio book apps might be game changers for me. Overdrive just does not have the titles I want!